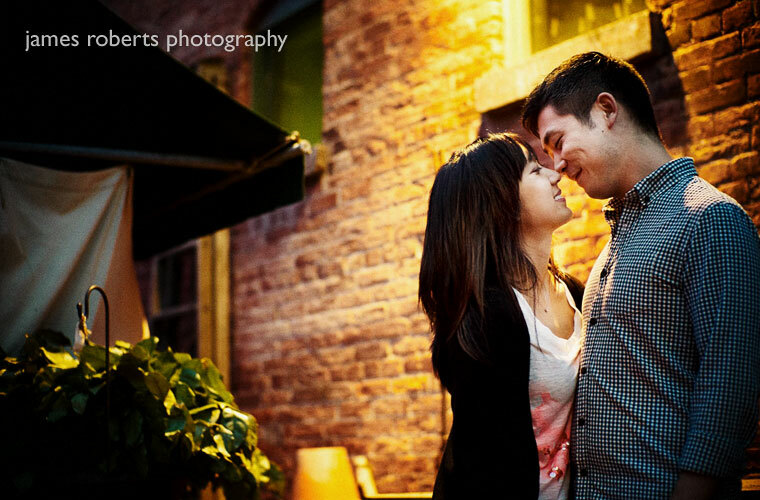 Another boost of warmth from tungsten light that happens to be flooding the background. As I mentioned in the “rainy day” post, you generally like to avoid mixed light, but in this case the sunset sky was just light enough to give nice skin tones from daylight while the tungsten works to amplify the colour and express emotion. The venue is the Toronto Distillery district. We had a load of fun on Toronto Island and back in the Distillery too, just as the sun had set. And that’s another Noctilux 1.0 M9 shot, this time the Noctilux is stopped down to make sure both Jenn and Scott are in focus. As you can see here, though, it’s very flare-resistant and gives fine detail throughout a shot. In this one, I didn’t have to add much contrast at all. The camera here is the Leica M9, a wonderful tool for creative expression, not in the least because its colour capability in these conditions is exceptionally good. The Noctilux is not just a one-trick 50mm lens, either. It really is a superb 50mm lens with lots of detail stopped down. For proof, look at the top of this blog. That’s also a Noctilux shot–and also from Jenn and Scott’s engagement–but this time the Noctilux / M9 combination is recording them looking over the Toronto sky line at f5.6, so you can see them and the skyline in detail, even in the Web-sized shot.